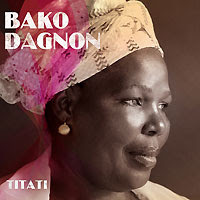 The debut album Titati from Malian songstress Bako Dagbon finally got a UK release this month (its been out for some time in France). Having listened to it now for over three weeks I know many people will absolutely love this record. At first pass the album is reminiscent of Salif Keita or even some of the production work of Jerry Boys for World Circuit. The person pulling the strings is none other than musical director François Bréant, previously involved on recordings by Salif Keïta, Thione Seck and Idrissa Soumaoro. There is a strong acoustic sound with violin, mouth organ, acoustic guitar and soaring vocals...all with a sense of space in the mix, in tune with all the separate elements and in tune with the African heat.